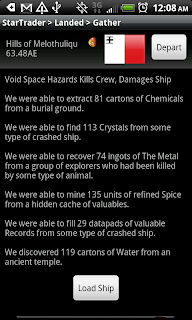 A new release of our epic space role playing game Star Traders RPG has been released to the Android Market. The newest release, Star Traders RPG version 3.1.6 includes a number of feature updates and minor bug and performance fixes. Our hero, the intrepid spaceman spiff struggles to pay for his Water Fuel and repairs to his damaged spacecraft. How will he afford his spice?